All JR Hokkaido passes are valid for Ordinary Class travel only and all can be bought in Hokkaido or at some JR East Travel Service Centers on Honshu; alternatively through some authorised agents before arrival in Japan; for details see pp36-9 in Japan by Rail. For more details see JR Hokkaido‘s website. See p46 of Japan by Rail for itinerary suggestions. Children aged 5 and under travel free providing they do not occupy a seat; those aged 6-11 pay half the adult rate. Prices are fixed in yen, but the charge is payable in local currency. This is available as a 3-, 5- and 7-day pass, and also as a flexible 4-day pass pass that can be used on any 4 days in a 10-day period from the date of issue. Anyone with ‘temporary visitor’ status stamped in their passport is eligible to buy a pass. These passes are valid on all JR Hokkaido trains (inc with reserved seats) but not on the Hokkaido shinkansen and therefore not for the journey from Honshu to Shin-Hakodate-Hokuto (for Hokkaido). 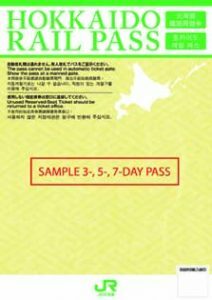 JR Hokkaido also sells a 7-day Hokkaido Round Tour Pass (Hokkaido Furii Passu) which costs ¥26,230 (£164/US$231). 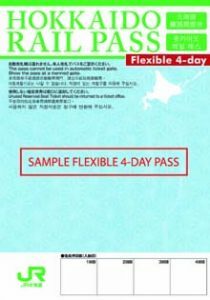 The ticket – which, unlike the other rail passes, can be purchased by anyone – offers 7-day unlimited rides in the Ordinary Car unreserved carriages of express/limited express services as well as on some JR Hokkaido buses. You can make up to six seat reservations for free during the validity of the pass. However, the pass cannot be used during peak holiday seasons: Golden Week (29th April-5th May), Obon (mid August), and New Year.